90lb per dumbbell, 5lb increments and one of the fastest adjustment systems out there, the Bowflex Selecttech 1090 dumbbells pair have been designed with the serious lifter in mind. The bigger brother of the popular 552’s the 1090s only differ in weight range, are they worth the extra $’s? In our review we take a close look at this heavy-duty pair, we’ll also compare them to some of the other adjustable dumbbells in this price bracket. 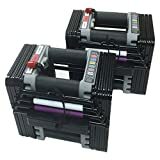 There are basically three top sets of dumbbells in this price range and they are: the Powerblock Elite 90s, Iromaster TwistLocks, and the Bowflex SelectTech 1090 dumbbells pair. Our review focuses on the Bowflex pair but if you are interested in either the Powerblocks or Ironmasters there is a short summary for both pairs at the end of this review, for now, you can take a quick look at our comparison table. 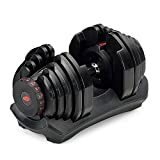 Please Note: Currently on Amazon the price showing for the Bowflex 1090 is for one dumbbell, Price shown for Powerblocks and Ironmasters is for the pair. When Bowflex first released their flagship dumbbell the 552, it quickly became one of the most popular dumbbells on the market, their patented SelecTech adjustment system was loved by a wide range of fitness fanatics because of the speed by which you could change the weight setting of the dumbbells. Nothing out there at the time could beat the versatility and speed of Bowflex’s new adjustable dumbbell set, no longer did we have to take the extra time to change weight plates between sets. This new school set did away with slow adjustment times and old school collars and bars, Bowflex’s new adjustable set was great for drop sets, it also proved to be an excellent space-saving design, eliminating the need for 15 sets of fixed weight dumbbells. The main drawback of Bowflex’s 552 design was the limited weight capacity, their select system does not allow for any extra weight to be added if you happen to outgrow the set. Whilst outgrowing the 50 lb dumbbell wasn’t a problem for most, some of the serious lifters were staying away from the 552’s because of the limiting weight range, therefore Bowflex needed a heavier dumbbell for seasoned lifters and that’s where the 1090s came in. A whopping 90 lb per dumbbell makes this set appealing to all. The weight range of the Bowflex Selecttech 1090 dumbbells pair, goes from 10lb all the way up to 90lb, this makes the pair ideal for heavy dumbbell workouts. Having a higher weight range will certainly increase the dumbbells longevity. The adjustable dumbbell market is flooded with sets restricted to the 50lb per dumbbell maximum weight, this is mainly due to their adjustment systems not allowing the use of any additional weight packs, stopping serious lifters buying the 552’s. Although the adjustment system of the 1090s is exactly the same as the 552’s, meaning it is still restricted to the dumbbells sold weight, it shouldn’t feel or be treated as restrictive at 90lb per dumbbell this should easily be enough for most experienced lifters. And with a weight range of 5-90 lb, this dumbbell should appeal to beginners too who are looking to take their lifting to the next level. There are many sets of dumbbells which only adjust in 10lb increments, this is usually too big a jump for most beginners. The 5lb increments of the Bowflex should be very useful for people looking to break through to the next level in their training. The 1090s will provide enough scope to allow the athlete to grow with them for many years. Let’s talk a little about the price, the Bowflex 1090s sell for around $300 per dumbbell, a set of Elite 70lb cost $430 and an expansion pack for the Elites is around a $140 and the 75lb Ironmaster with a stand is a similar price. So all in all when first looking at the Bowflex you would think they are super expensive but when you get the other two sets up to the 90lb mark they level out a similar price. The dial a weight system has to be my favorite feature of the Bowflex SelectTech 1090 dumbbells pair, what makes this adjustment system appealing is its simplicity, you simply turn a dial at each end of the dumbbell to the desired weight you need. An extra bonus is, if you sometimes like to train with offset weight configurations, the dumbbell has a dial on each end of the handle letting you change the weight setting independently, great for exercises like the farmers walk hammer curls, lunges etc. Each dumbbell has its own cradle which is molded to fit each dumbbell perfectly, this helps to hold the dumbbell plates in an upright position. It’s worth noting you can only adjust the dumbbells when they are in the cradles. This is a very good thing as you do not want the plates moving when the dumbbell is being used for a workout, once the dumbbell is out of its tray/cradle the dumbbell locks tight. As with any product from Bowflex, we expect a quality item, and yes this is just what you get with the 1090s, the 1090s weight plates are made from high strength steel helping to provide a secure lock for the brackets when the dial system is in use. The dial a weight system is first class and foolproof, providing one of the easiest and quickest systems out of all adjustable dumbbells, it is the dumbbells biggest selling point. The weight plates are coated in a thick plastic layer, not only does this help protect the metal weight plates it also makes it nice and easy to take the dumbbells out of the cradles. A weight plate encased in plastic is going to allow the dumbbells to move smoothly next to each other. But as with their 552’s, there will always be problems when mixing plastic with heavy metal. Bowflex specifically say not to drop the dumbbells from any height, one, because of the plastic coating surrounding the dumbbells and two, because of the fragile nature of the adjustment system. This is where you may run into a few problems with the Bowflex 1090s. If you drop one of these things there’s a good chance you’re going to crack a plate casing, cracked plates do not come under warranty neither does a broken adjustment system/handle. You will be looking at expensive repair bills if you’re unlucky enough to drop one, drops are also accountable for weight plates falling off when training. Whilst most reviews for the 1090s are positive, there are a few negative reviews which involve plates falling off the handle when training, this is very dangerous and something worth noting. My thinking here is not a fault from Bowflex, it’s more likely a customer has dropped the dumbbells and cracked a plate, this will lead to the plate not being able to lock securely to the locking mechanism, I’m sure if there was a design fault with the dumbbells they would be withdrawn due to the nature and danger of the problem. Handle length is something many people seem to forget to consider before they buy a set of adjustable dumbbells, compact is always better when it comes to handle length but with sets like the Bowflex which have adjustment systems running the whole length of the handle, long handles are unavoidable. 17’5″ handle is long, ok you would expect a long handle when lifting heavy because of the amount of weight on each side of the handle but as I mentioned above because of the design of the adjustment system the handle length will remain the same whether you are lifting 10 lb or 90 lb. Long handles can cause issues with dumbbell clashes when pressing or the dumbbells hitting the side of the body when curling. Handle length is not a deal killer and will take some time getting used to, but the longer handle will make the dumbbell feel slightly unnatural and can affect form. Both the Powerblocks and Ironmasters handle length only increases as the weight does making for a much more compact natural feeling dumbbell. 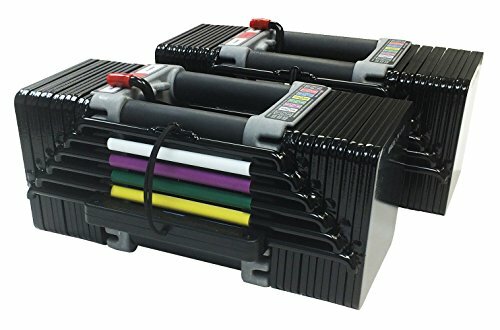 The Powerblock Elites come in 3 different weight ranges, the 50 lb set 70 lb set and the 90lb set, but the great thing about this set of dumbbells are the addition of expansion packs. The reason why expansion packs are so useful is you may grow out of a dumbbell set in a few years as your strength increases and need extra weight, so if you were to buy 70 lb set you would be able to buy the 90lb expansion pack as and when you need it. It’s a great option to have, not many people are going to lift as heavy 90 lb so buying either the elite 50 or 70 lb set is a viable cheaper option and if you do progress further and need a heavier set later on down the line at least you have the option. The Powerblocks are fast to adjust in 5lb increments, they use a magnetic selector pin which simply slides in and locks in place but if you want to go up in 2.5lb increments then you have to use the 2.5lb cylinder which you can add to the handle. It takes a little more time but it’s nice to have the 2.5lb increments for some isolation exercises when smaller weight increases are preferable. And finally what sells this excellent pair of adjustable dumbbells for me has to be their compact size, the Powerblocks handle only increases in length as weight is added, this allows for a close to as possible feel of a fixed weight dumbbell. Defiantly a bit tougher than the Bowflex, due to less plastic being used in the build, although I wouldn’t recommend dropping from a height, the Powerblocks should take a few drops without any issues. One of the best if not the best adjustable dumbbell sets on the market. The Ironmaster dumbbells set is a set for serious lifters, the most durable option available because of the all metal construction, you can be sure this set will last a lifetime and this is backed by their lifetime warranty. 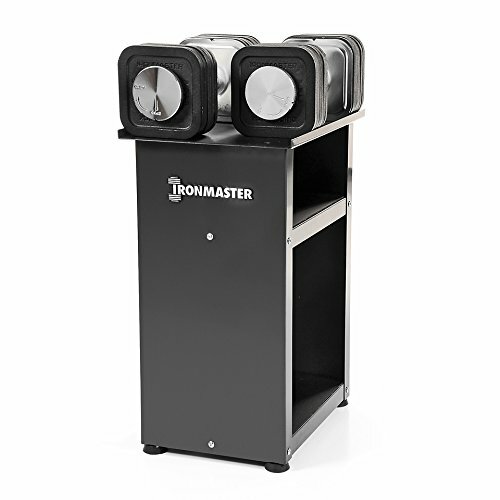 Available as a 75lb set sold with a stand, Ironmaster also offers two expansion packs, a 120 lb and 165 lb per dumbbell, by far the heaviest weight range offered out of the big 3 and a weight range that will not be outgrown by many or anyone. Its great to see Ironmaster have thought their design through fully with their compact design just like the Powerblocks the Ironmasters handle only increases in length as the weight is increased. 2.5lb increments also make the Ironmaster a very versatile option. There’s only one real negative with the Ironmaster and that’s the time it takes to adjust the weights, it’s by no means slow but because you have to manually add and take off the weight plates it slows down adjustment times, so drop sets are out with the Ironmasters. If you don’t mind slightly slower adjustment times but love a dumbbell you can be a bit rough with then the Ironmaster TwistLocks should prove to be a very durable heavy duty option. Summary The Bowflex Select pair are basically a higher weight version of the 552, if your looking for speedy adjustment times then the 1090's are a very good choice. Sadly they are plagued by the same issues as the 552's, long handles and too much plastic in the build...Still an excellent set as long as you do not drop them!